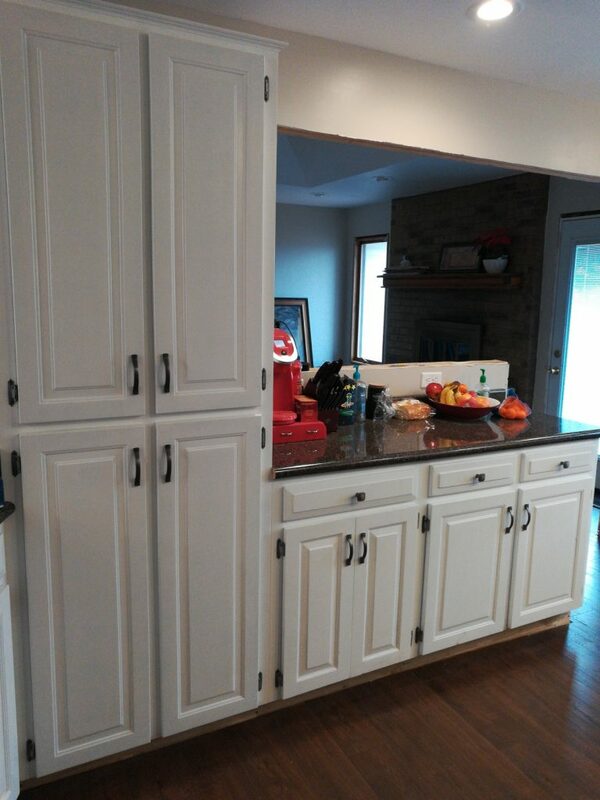 The cabinetry after. My husband actually rearranged our cabinets, creating our little “window” into the living room. 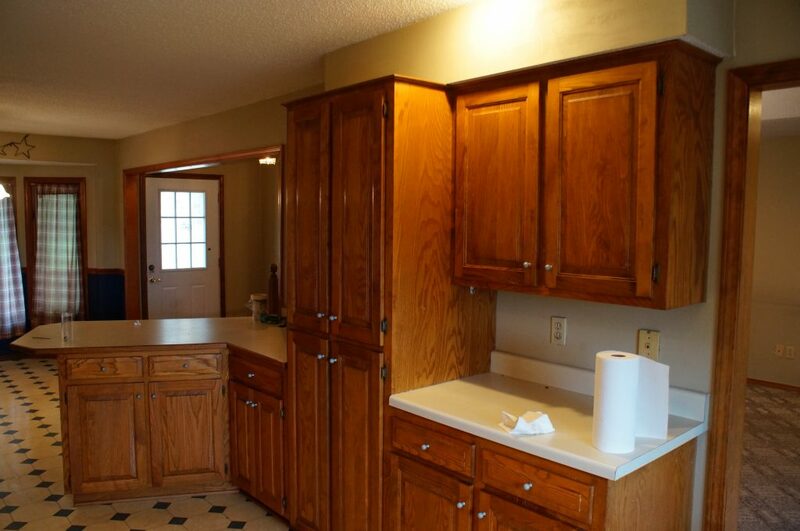 But since some of you have asked, here are all the details on our kitchen. First of all, shout out to my husband who did a good majority of the work. I’m so glad that he grew up in Wyoming and helped build his parents’ log cabin (with his 3 brothers) back in the day. All of that handy construction knowledge has really paid off and saved us some major dollars. 😍😍😍 He took down the popcorn ceiling texture on our main floor, installed our flooring, installed recessed lighting, installed our countertop, and painted our walls and cabinets. (Although we had somebody else work on the doors elsewhere to save time.) He also rearranged a bit of our cabinetry to make a “window” looking into the living room for a more open concept feel. We decided to go with laminate for our countertops. 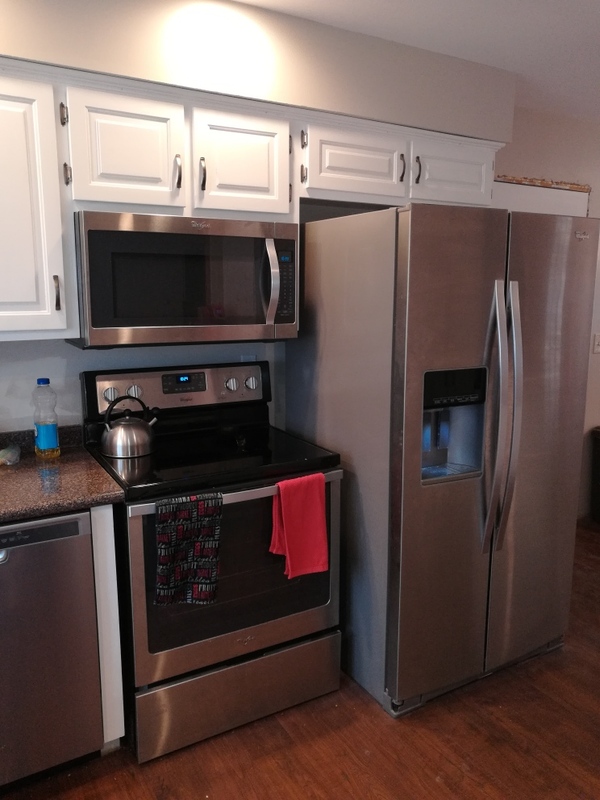 As fancy as granite is, you definitely pay the price and it was a choice for us between spending a good chunk of change in our kitchen and not doing nearly as much in the rest of the house. 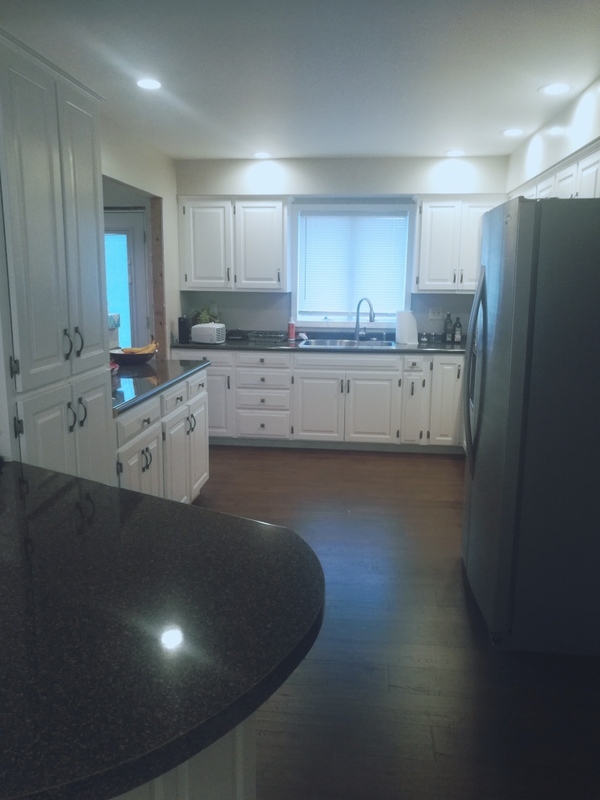 I’ve mentioned this before but in case you’ve recently started reading my blog, my husband and I bought our home with the intent of pretty much remodeling the whole thing – even making some adjustments to the floor plan. 😊 We also decided to do this while living in the house. It has 5 bedrooms and 3 full bathrooms but we decided to move us (and our two children) into the basement of our home while remodeled the upstairs. This meant we used the main area in our basement as a living/dining/office area while our kiddos shared a big room, we had our own bedroom and shared a full bathroom. It wasn’t too shocking of a lifestyle aside from the kitchen. That’s probably the room that I missed the most during this process. The upstairs is almost done which means now that our walkout basement is next on the chopping block. Thankfully there is not NEARLY as much to do there as there was upstairs so we should be smooth sailing from here on out. I know handling a remodel this way is not for everyone but I’m glad we did because unlike our last house we’ll actually get to enjoy the work we put in sooner, instead of updating things before we’re ready to sell. We’ve owned our home for almost 2 years and have been living here for a year and a half. It was definitely a hard and bumpy road at times but as my husband likes to say, “You can’t argue with the results.”. 😂😂😂 He’s completely right. At this point, our kitchen is about 90% done. 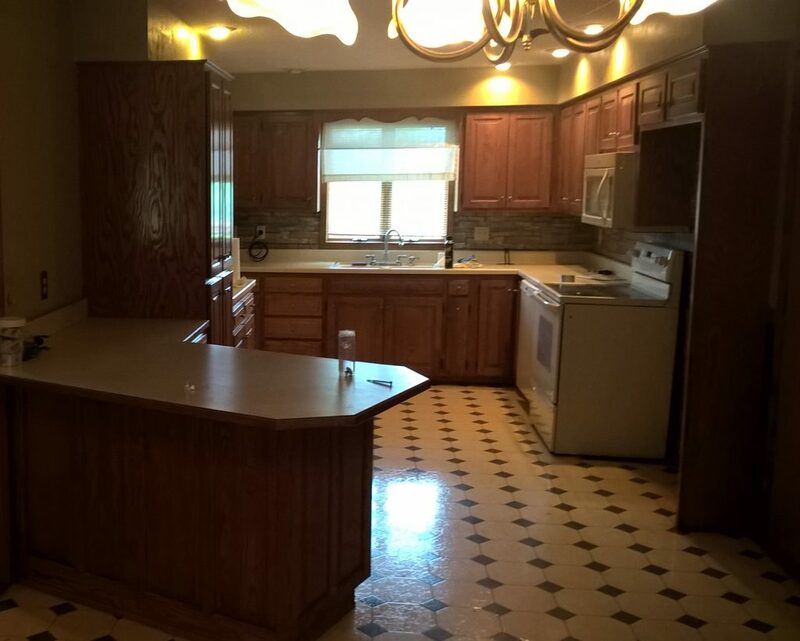 We don’t have a backsplash in our kitchen and we still need to put up some woodwork. Other than that, everything is to our liking and I couldn’t be more grateful. 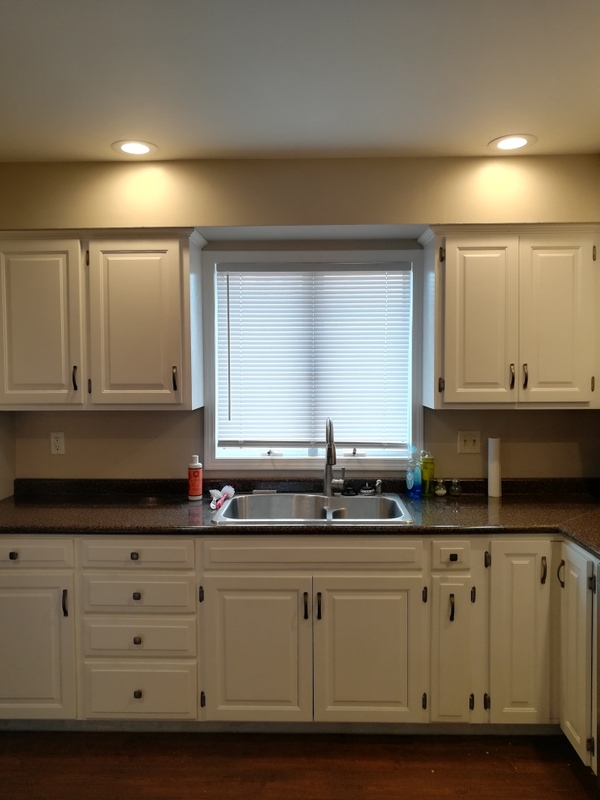 The cabinetry and counter-top combination is one of my absolute favorite things in our kitchen. I don’t mind doing the dishes as much anymore. I’m planning on adding home updates to the roster of my usual blog posts. If you could remodel one room in your home right now what would be? Have you guys remodeled? Was it harder or easier than you expected? I want to hear your stories. Share them in the comments!